When I was growing up, I was a Girl Scout, and we camped a lot. Between summer s’mores and earning badges, my mom made sure we had everything we needed to successfully camp and have fun! Learning to be a master camper really helped when my entire 6th grade went away for 3 days to a program called Outdoor Ed. It was a sleepaway camp that the grade prepared for all year by learning regional botany, team building, outdoor crafting and physical training. I was petrified to leave home and go by myself even though all of my friends and teachers would be there. It REALLY didn’t help that the night before I was supposed to leave I got my period for the first time. But Mom had me prepared with everything I needed and made sure I was in good physical condition to handle the outdoor camp. It ended up being one of the shaping experiences of my life, and I learned a lot about how to take care of myself when I was away from home (the early 90’s program lasted until 2011, when it was struck from the county budget, which made me so sad!). Is your child going to summer camp this year? Whether they are an old pro or a first timer, I have some tips that will help you prepare them for a great experience at camp! Help your kids on how to participate and have fun. Make sure they understand that camp is only for a little while. They will come home soon to share all their adventures! Conflict mediation tools are VERY useful in adolescence. Mental Health needs care, too! Write some letters of encouragement and excitement and mail them to camp, or deliver them to a counselor for passing out over the duration of a week. Blankets, a stuffed animal, or even a small frame with a picture of your family can come in handy before campers hit the sack every night. Reminders from home are lovely! Send all medications, properly labeled with your child, and make all counselors aware of procedures and allergies. Try some of these OTC remedies if you have small kids, or be sure to pack and doctor recommended medication like allergy medication, facial tissue, etc. SPF lip balm, a good hat and a pair of sunglasses for their outdoor time. Campers spend most of the day outdoors learning and having fun, and we all know how important physical sunblock is! Try to find formulas like Badger that are more natural with less chemicals. BEFORE they leave home, make sure they are healthy and is ready to take on all activities with a camp physical from MinuteClinic. Physicals are inexpensive compared to urgent care. Even if your specific camp doesn’t require it, it’s important to make sure your little ones are healthy & safe to participate in chosen activities like sports, water play, etc. No appointments are needed, and you can come in 7 days a week! If your child has already attended camp, what kind did they attend? I’m sure Red will be ready for fun activities like theatre, baseball, natural science and music camp, but I want to hear your experiences. Thank you to Minute Clinic for sponsoring today’s discussion and offering our family a complimentary physical! I love the Minute Clinic. It has been very helpful for us. I hope someday that I won’t be so paranoid and will be able to let my kids go to camp! We don’t camp, but we do spend a lot of time outdoors. We are more of a beach family, so we have to do many of the same things. Very good tips. Fantastic for any outdoor trip. Great tips,My kids do not have summer camp.We can still use these tips for our other outdoor activities. I love that Minute Clinic has those easy camp physicals. I remember always needing that for sports too! Loved girl scout camp too! Canoeing and horseback riding, it was the best. We don’t do any camps here, maybe camping as a family but beyond that no way do I send my kids away. I couldn’t bear it. 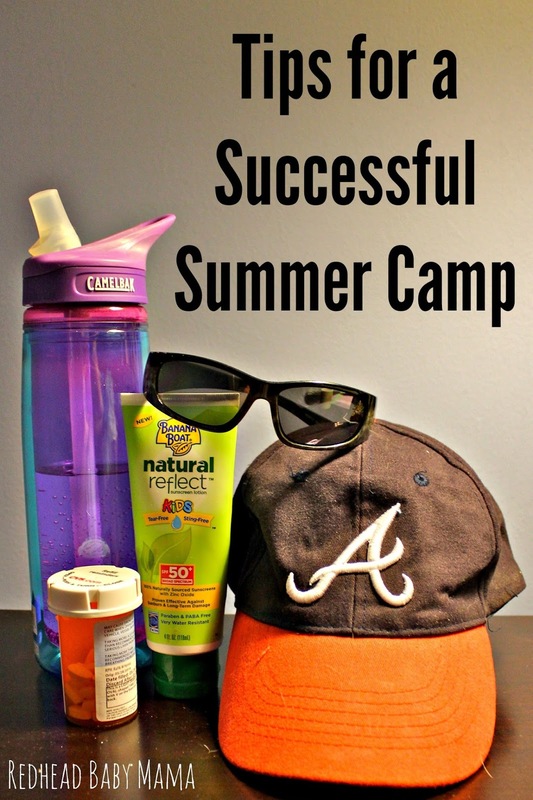 These are great tips for the many parents who do have their kids in camps this summer though!! Great tips! It’s nice that they are offering such affordable physicals. I wonder if they are any different than a well-child check up? I love the idea of a throw away camera. It would be great for the kids to capture their memories without me having to worry if my camera will make it back in once piece or even at all! These are definitely some good tips! Aside from immunizations, It’s a basic checkup of physical condition (heart lungs, etc) that makes sure you can participate in most activities. They say that it doesn’t replace a well visit, but is a nice mid year compliment! Putting names on everything is a must too, for camp! It’s amazing what goes out but doesn’t come back. 😉 I Like your list! Labeling everything is a must. Great tips. My kids aren’t old enough for camp yet, but we send a group of kids from church. I love that CVS Minute Clinic offers summer camp physicals! Love your list too, lovies are a must! Mine are only doing day camps this summer. My oldest might do a sleepaway camp next year, though. Ooooh I went to outdoor ed too! But I was super shy back then and I didn’t have such a great time. Great tips for preparing them! I am so excited for my kiddo to be big enough to enjoy camp!! Is it too early to send my kids now? No one would notice that I just dropped off a 2 year old right? No kids to send to summer camp– but good tips for just being outside!!! Those are great tips. I love the idea of a throw away camera. Must do that! Awww I remember summer camp! I loved it! Love the tips! Sunscreen is such a big deal but so many people don’t realize how often you need to reapply it! That’s a great price for camp physicals. I never remember them being that cheap when my child went to camp. These are great tips! I had no idea the did camp physicals! Awesome! A camelbak is crucial all summer! Thanks for these tips. I miss camp!